$$€1500 on your first 5 deposits! 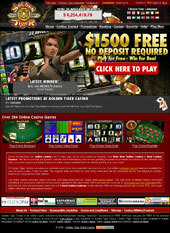 The Casino Rewards loyalty program is used at the Golden Tiger online casino. Players accumulate loyalty points, and redeem 100 points for one dollar in casino chips. These chips can be used at all the participating Casino Rewards online casinos. The Golden Tiger download casino offers players more than 458 online casino games from which to chose. There are many varied games choices, including the most popular of the game, slot, blackjack, video poker, and roulette. Players can also join in the fun with poker games, keno, scratch cards, craps, and more. There are more than 15 online casino progressive jackpot games offered, most of which are online casino slot progressives, including the Mega Moolah progressive slot that begins with a minimum progressive jackpot payout of one million. Golden Tiger Casino is powered by Microgaming online casino software. Players who do not speak English or are more comfortable in other languages have a big range of languages to choose from, including German, French, Dutch, Portuguese, Chinese, Italian, Japanese, Swedish, and more. Players may do financial transactions and play in one of four currencies, the €, the UK £, the US $ and the CA $. Credit/Debit Card (Visa, MasterCard, Maestro, Solo and Diners Club International), EntroPay, Click2Pay, NETeller, Ukash, PaySafeCard, Skrill (Moneybookers), EZIPay, ECO Card, Direct Bank Transfer, Wire Transfer, eCheck, UseMyWallet, UseMyBank. Mailed checks, Eco Card, UseMyWallet, MoneyBookers, Click2Pay, OCT (Visa), Courier Checks, Wire/DBT/Swift transfer, NETeller, EZIPay, Initial CADEFT, Bank Transfers, and ACH. Customer support is available at any time that the players need it. Players can contact the online casino via toll-free telephone numbers, emails, and can also use the call-back system, in which the customer support representative will call the player back at a telephone number sent in by email.